Novotema have exhibited for the very first time at MedTec Europe 2018 – an annual event bringing together medical professionals from around the globe to display pioneering trends and insights in medical technology. It is the first trade show our sealing experts have exhibited at, showcasing our comprehensive and adept suitability for medical technology applications. The event, which took place in Stuttgart between 17-19th April, welcomed over 7,000 medical technology professionals from 76 different countries. 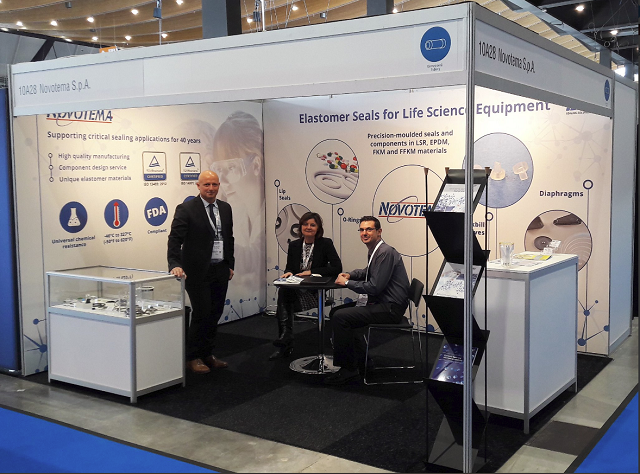 As experts in sealing solutions, Novotema play a vital role in manufacturing high performing, quality elastomer seals and components for a range of medical devices and equipment. Our engineers design and manufacture cutting-edge sealing solutions for medical, biotech and life science applications. The combination of high performance elastomer materials, manufactured in an ISO Class 6 (FS 209E Class 1,000) cleanroom, delivers the highest purity seals. Medtec Europe aims to bring together medical companies in the supply chain to share ideas, meet partners, and discover, experience and source products and services from all stages of production in order to create the next generation of medical devices. The criticality of medical devices means that specifying the correct sealing material is vitally important. Novotema offers a range of elastomer materials specifically developed to meet the requirements of the life sciences industry. Here is an insightful article on what makes Silicone the preferred material for life science applications. And if you’re keen to learn more, please download our Brochure on Life Science Sealing Solutions. For further information on Novotema’s medical device seals, contact a sealing expert today or click below.